At the “Writing in the Garden” workshop. I’m the gray-haired lady with my back to the camera. Photograph is courtesy of Blue Cottage Agency. It is inspiring to spend time with people who are fulfilling their passions for creative expression. I am fortunate to be experiencing more than my share of art immersion this week. I am still pumped from spending yesterday at the 3rd Annual Writing in the Garden Workshop in Minnesota. It was attended by writers of various interests and genres. Some are working on a project – others are published authors. Everybody was friendly and eager to learn. 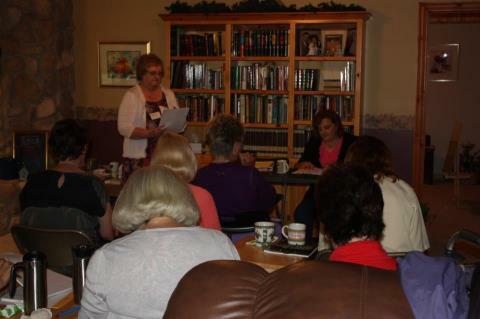 The workshop was led by writer and teacher, Angela Foster and historical fiction author Candace Simar. Check out Candace’s recently published book, Blooming Prairie, Book Four of the Abercrombie Trail Series. On Monday this week I joined some other members of the Kanabec County Art Association at a weekly get-together, where we work on our art projects or just enjoy each others’ company. I have found that artists are generally sociable and knowledgeable because they are interested in so many different subjects. Are you realizing your dreams for creativity and personal expression? It is not difficult or expensive to seek out camaraderie and educational opportunities with like-minded creative people. If you need a pick-me-up find a class, workshop or organization that appeals to your interests and check it out. Thank you for blogging about the workshop. I appreciate your comments and enthusiasm. Let’s do it again soon! I loved the workshop. Hopefully our paths will cross again soon.